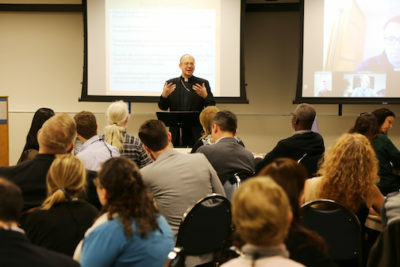 Bishop Barry C. Knestout told more than 60 participants in a diocesan evangelization summit that “Encounter the Joy of the Gospel and Set the World Ablaze” will serve as an important part of spiritual preparation for the Diocese of Richmond’s bicentennial in 2020. He said that in reflecting about what could be done in that regard, he looked at the plan that had been developed. “Encounter the Joy of the Gospel” was issued in 2014 as a multi-step evangelization program for the diocese. Bishop Knestout noted that in undertaking the New Evangelization, the Catholic community already had its mission. The gathering, organized by the Office for Evangelization, featured representatives of national evangelization organizations: James Carrano of Evangelical Catholic; Eileen Piper of FOCUS; Matt Rudolph of Amazing Parish; and Jonathan Lewis, assistant secretary for pastoral ministry from the Archdiocese of Washington who participated in the October Synod of Bishops on Youth.